The LED 'snap-on' ribbon connectors power cable makes a simple & secure way to add an extra power cable to a cut length of LED ribbon. The 'snap-on' inter-connecting cable with 140mm of cable allows for cornering or just spacing lengths of ribbon apart. To join two lengths of LED strip lights together seamlessly use the 'snap-on' coupling joint. 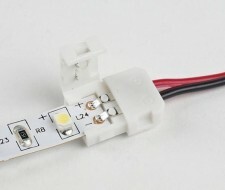 Available for static and RGB LED ribbon.